We’re all living for the weekend, or so the saying goes. Each new week brings the same old routine — work, school, chores, and the like — but also the boundless opportunity of two unstructured days. The weekend is our perpetual carrot — the reason we grind through the mundane. Why, then, do we so carelessly waste it? Laziness has some part to play (Netflix built its business on our lethargy, after all), but it’s not the reason we let the weekend slip through our fingers. The real culprit is hyperbole. The bigger the project, we think, the bigger the reward. In truth, these impressive goals are more discouraging than gratifying. Perhaps what we need instead are some bite-sized accomplishments. Enter the 2018 Honda Africa Twin Adventure Sports. Like the overlanding craze afflicting SUV and truck enthusiasts, adventure bikes are a booming trend among riders. The balance of on-road comfort and off-road capability has attracted those with a wayfaring attitude and budget for just one vehicle/motorcycle. The same bike that commutes through the workweek tears up the dirt every weekend. Following the reintroduction of the Africa Twin nameplate in 2016, Honda issued a series of changes for the bike’s 30th anniversary in 2018. Since our last meeting with the Twin, a 2017 model, Honda has added a throttle-by-wire system, revised instrument cluster, larger airbox, new exhaust, lighter battery, and lighter balance shafts. On top of these tweaks, the all-new Adventure Sports trim beefs up off-road capability with almost an inch of additional suspension travel front and rear, a thicker skid plate, crash bars, a steel luggage rack, a taller, flatter seat, taller handlebars, a taller windscreen, larger fuel tank, and heated hand grips. We don’t have to wait for the weekend to begin enjoying the Africa Twin’s smooth, 998cc, parallel-twin engine and slick-shifting dual-clutch automatic. Now about as refined as automotive DCTs, Honda’s transmission works seamlessly through six speeds, blipping the throttle imperceptibly on downshifts. A three-stage sport mode alters the gearbox’s shift points based on preferred aggression, or riders can switch to manual control via left-hand up/down triggers. Comfort and visibility are the Twin’s core strengths while battling traffic. Spotting slowdowns, even over SUVs, gives us ample confidence – as do the bike’s triple-disc brakes and standard ABS. The Adventure Sports’ taller handlebars lead to some sore shoulders after long trips, but they prove useful while stand-up riding off-road. When the weekend arrives, we forgo the big plans and opt for a casual ride to some local trails. With a 6.3-gallon tank, we don’t even need to fill up before heading out. 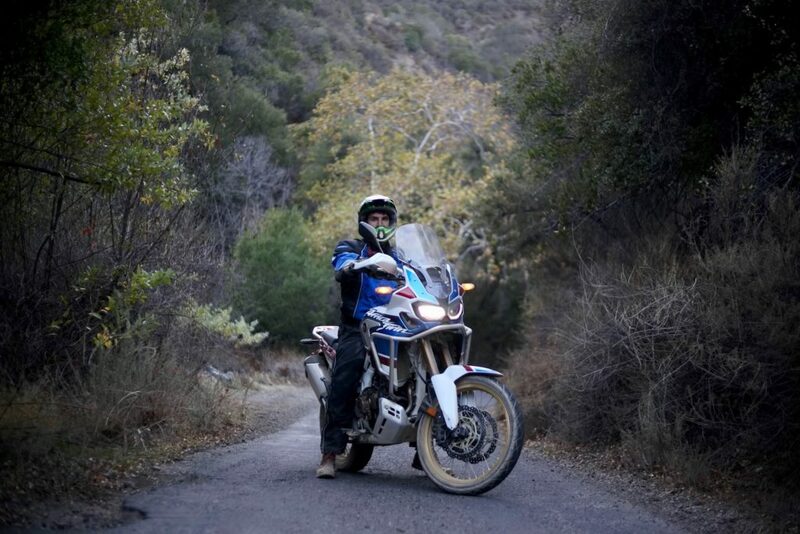 At the transition from pavement to dirt, we adjust the bike’s ride mode from Tour to Gravel, turn off the rear wheel’s ABS, hit the “G” button to eliminate clutch slip, and dial down traction control. 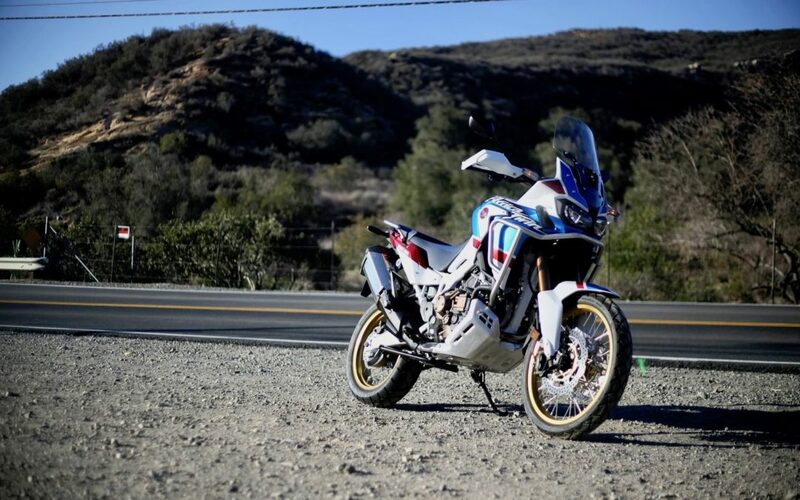 Busting out like its Friday at 5 p.m., the Africa Twin surges through dirt and gravel. Our Adventure Sports tester weighs a portly 556 pounds, but it doesn’t let on even slightly while dancing along tricky terrain. 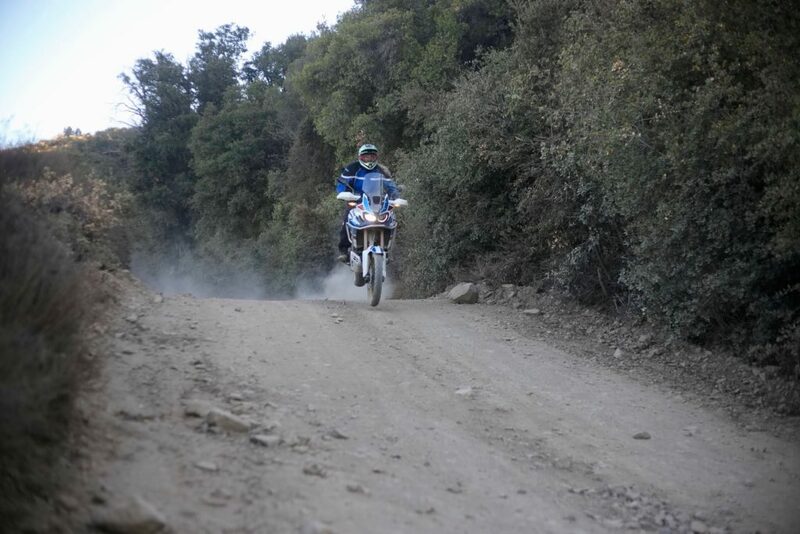 Washed-out ruts are no match for the Twin’s extensive suspension travel and 21-inch front wheel. Kicking over mounded ramps, we’re thankful for the 2018 model’s wider foot pegs, which provide excellent stability on landing. On ultra-slow, rocky paths, we might miss the precise control of a manual, but for all other conditions, the tunable DCT is flawless. A generous portion of low-end torque sorts out unstable sections and heeds playful wags of the rear. 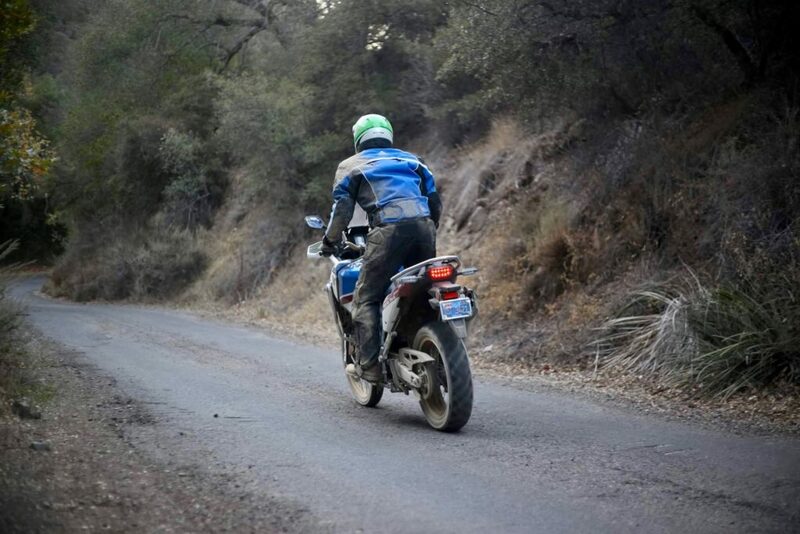 It’s easy to become familiar with Honda’s adventure hero, and confidence off-road builds as rapidly as on-road. Half a day. That’s all it takes for the Africa Twin to satisfy your weekend yearnings. In the time it takes to visualize the next big project you’ll never complete, you can suit up, hop on your Honda, find a fire road, and resolve every trace of the week’s tribulation. And don’t worry: you’ll still have time for a Netflix binge.